A lot of people go visit this lake in the winter for the famous methane bubbles but I believe other patterns like thick ice cracked and frozen ripples on the surface can be as interesting. It was another early morning wake up call and leaving the warm bed to -16C and windy weather wasn't a problem knowing that nature would probably put on a nice show again that day. 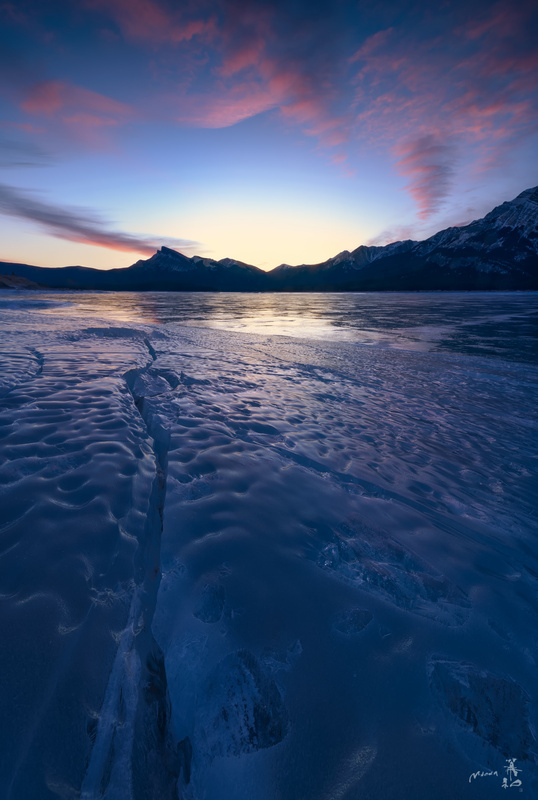 As it was still dark, I walked around the area and found this big crack that would lead towards the mountains and bright light of coming sunrise so I settled there and waited for the nice sky to appear. For this shot as I wanted to keep everything in focus I did a focus blend of multiple exposures.